Notes from the Bruce Monroe Site Surplus Meeting | Park View, D.C.
(Bruce Monroe Surplus Meeting, March 21, 2016). Last night’s public meeting on the proposed surplus of the Bruce Monroe site lasted for roughly two hours. 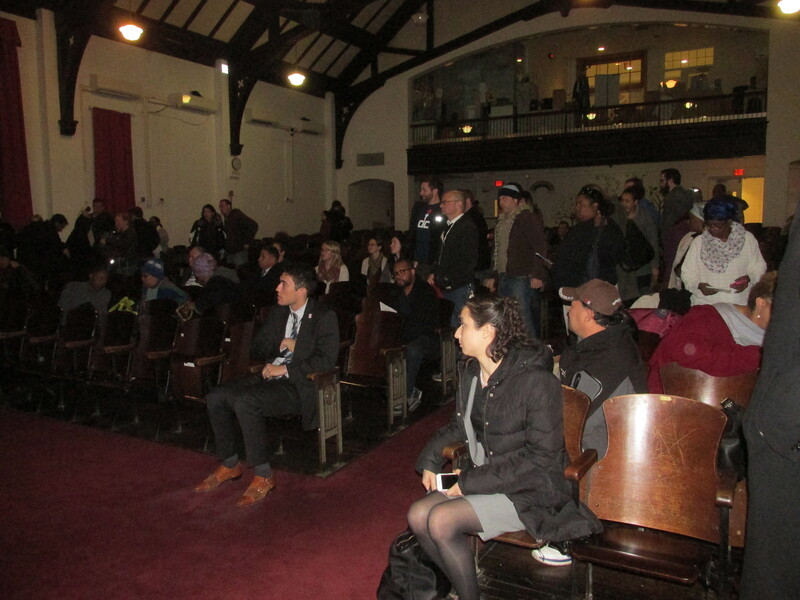 It was hosted by DMPED’s Lee Goldstein in the auditorium of the Park View School building. The meeting began shortly after 6:30 with a brief presentation on the surplus process, along with a very brief overview on where things stand with the Park Morton redevelopment as that project is the desired use for the parcel. After the initial presentation, those in attendance were given an opportunity to add their testimony to the surplus record that will be delivered to the Council for their deliberation on the matter. Those speaking were limited to 3 minutes, and the testimony was recorded and will later be transcribed. Slightly more than 100 people attended the meeting with at least 1/3 of them testifying. Residents spoke both in support and opposition to the surplussing of the parcel. Many of the themes and comments were consistent with statements made at earlier Park Morton engagement meetings. Those who favor keeping 100% of the site as greenspace questioned how a property could be considered surplus with no identifiable public use when the “property is used all the time.” Several also referenced the old Hebrew Home site and vacant private property on Georgia Avenue as better build first sites. Residents who favored surplussing the site also spoke in favor of using it for Park Morton, and the need for affordable housing in the city in general. One resident talked about how he uses the tennis courts at Bruce Monroe frequently and would probably not be able to find a new tennis court that he could walk to due to the development of the site — but stated he still supported the surplus of the property as he considered affordable housing a greater public use than a tennis court. The testimony — while personal at times — was largely orderly. Those unable to speak, or who wish to submit written statements, can do so until close of business on Wednesday, March 23rd, by sending statements to Lee Goldstein at lee.goldstein(at)dc(dot)gov. This entry was posted on March 22, 2016 at 7:01 am and is filed under Development, Real Estate. You can subscribe via RSS 2.0 feed to this post's comments. I didn’t hear any testimony explaining why exactly the park should be surplused. The law states that land should be surplused when the mayor “believes that real property is no longer required for public purposes”. I heard lots of people testifying in support of affordable housing in general, and in support of redeveloping Park Morton, but none of them even bothered to make an argument that the property is no longer required for public purposes. On the other hand, lots of people testified that the land is still required for public purposes, namely s valued community park. Those people were derisively dismissed as a bunch of nimby gentrifier who care more about tomato plants and tennis than poor people, which is pretty much the argument that Bowser and Nadeau have been making. Neither of them bothers to explain why giving a valuable and valued park to a developer to build 300 apartments is the best way to help the residents of Park Morton. I was also interested to hear that the plan is to have only 20% market rate. I don’t recall hearing any actual numbers before. It would be nice if they would present their actual plan before the surplus decision, so that we can make an informed decision. Yep, the ANC survey results were swept aside as having too many NIMBYs. When we were given the survey, no one said anything about Park Morton being moved to Bruce Monroe. Any concerns that neighbors have had about this drastic change have been swept aside as NIMBYism. Most of the people saying “deal with it” don’t live here or plan on staying to live or raise a family. They won’t be around to deal with the consequences. It is tiring and the government and developers really have no idea who lives in the surrounding blocks. We have a lot of families on the block whose voices should be given equal weight. Our community was already deceived about getting a new school and we are supposed to blindly trust the government again? This is my home and these decisions directly affect my family and my children. I have a right to know what is REALLY being planned for my neighborhood. Nadeau needs to go and she needs to stop the affordable housing rhetoric. I will not vote for her in the next election. Is the overall Park Morton redevelopment plan still a 1 for 1 build or are they now increasing the total public housing units now? From what @jcm stated if only 20% are to be market rate that would leave 240 public/affordable units for the one BM site and that is not including the PM rebuild and transfers already to the Avenue. That doesn’t add up, I feel there should be a much higher market rate percentage or we will end up with the same problems that exist at the current Park Morton complex just with a shinier finish. He said 20% market rate, the rest a mix of public and affordable at 60% AMI. I don’t believe he mentioned what the split of that mix is though. He was definitely only talking about the Bruce Monroe portion. It’s clear that this project is much bigger than just a replacement for Park Morton. It’s going to be a big money maker for the developer. It’s good to be a friend of Muriel’s. I want to know if all the row houses being proposed will be market rate or if some of them are affordable or public housing. I get the impression they will just be market rate, and that this redevelopment is not actually going to mix the income levels. They are doing 1/3 1/3 1/3 but not equally dispersed throughout the project. The developers know they will make more money selling the market rate housing if they can concentrate that housing together. I enjoyed when the lady told our elected official to stop checking her email and laughing and to listen to her constituents. Nadeau is a real class act /sarc. Can’t wait until this gets constructed and Nadeau moves out of DC with her new fiancé. What a joke. give the park residents section 8 vouchers, leave the park as is, replace park morton with market rate housing. problem solved.